The City of Cornwall is steeped in a rich and diverse history. Originally named New Johnstown, the name was changed to Cornwall in honour of Prince George, the Duke of Cornwall. The City was later incorporated as a town in 1834 and became a city in 1945. Cornwall was first settled in 1784 by United Empire Loyalists consisting of the officers and families of the First Battalion King’s Royal Regiment of New York and a contingent of the 84th Royal Highland Emigrants. This group of disbanded soldiers and Loyalist refugees, led by Lieutenant-Colonel Sir John Johnson, came to the scenic and fertile site, intent on building a new life. For years, these Loyalists had fought on behalf of Britain in Northern New York and Vermont during the American Revolutionary War. These people came to settle and prosper on the lands which the Crown had granted them in reward for their loyal service during the war. Owing to its strategic location, Cornwall served as a garrison town, as well as a communications and supply post during the War of 1812. At nearby Crysler’s farm, the Loyalists successfully repelled American troops in one of the most famous battles of the War. Soon after its settlement, Cornwall evolved into an administrative centre for Eastern Ontario and made important contributions to the province’s growth. Under the influence of schoolmaster John Strachan, who would become the first Anglican Bishop of Upper Canada, Cornwall was transformed into a unique centre of learning and political influence that served as training ground for the “Family Compact”, Ontario’s ruling class until the 1850’s. One graduate was John Sandfield MacDonald, the first Premier of Ontario. This early and colourful history makes Cornwall one of Ontario’s oldest permanent settlements. In 1984, the city recognized its historical heritage through a year-long celebration. The Bicentennial was marked by various activities, including the publication of a 500-page book, entitled From Royal Township to Industrial City, that sketched in detail Cornwall’s distinctive past. Significant chapters in Cornwall’s history were written during the latter half of the 19th century as the town emerged as an important industrial centre in Eastern Ontario. Construction of the Cornwall Canal between 1834-42 provided transportation and water power for the numerous mills and later textile plants which located along the waterfront. Industrial sites were first laid out in the mid 1840’s, and soon flour mills, tanneries, and woollen mills were in operation. Among the first major manufacturers to locate in Cornwall were the Stormont, Dundas Canada Cotton Mills. The early growth in Cornwall’s industrial sector can be attributed to many of the same factors that continue to attract manufacturers to modern-day Cornwall: unlimited waterpower awaited exploitation, a major market, Montreal, was in close proximity, and a labour force was at hand. The industrial expansion that occurred on the waterfront from 1870 to 1880, at a time when the rest of the country was experiencing severe recession, resulted in a doubling of the town’s population, from 2,033 in 1871 to 4,468 in 1881. A major industry that had a significant influence on the City’s economy was built during this period, namely the Toronto Paper Company, which later become Domtar. Amidst this flurry of activity, a historic event took place in April 1883, when electric lighting was installed in the Canada Cotton mill. Another period of staggering growth took place between 1921 and 1931, when Cornwall’s population increased by fifty percent. A highlight from this era was the establishment of Courtaulds Canada Inc.’s rayon manufacturing mill. Another large industry of note, CIL which became ICI, established in Cornwall in 1935. Cornwall’s steady growth continued in the 1950’s with the building of the St. Lawrence Seaway. Construction of the Seaway began on August 10, 1954 and was finalized on Dominion Day, July 1, 1958. Thousands of spectators watched as thirty tons of dynamite were detonated causing the last coffer dam to flood the riverbed and Lake St. Lawrence. This historic event marked the development of the largest international hydro-electric power dam. For the past several decades, Cornwall’s economy has continued to grow and change. Today, Cornwall is a modern community with a very diverse economy that includes manufacturing, logistics/distribution and service sectors. The following provides a brief historical snapshot of the role of Cornwall and its people during the War of 1812. On June 6, 1784, Lieutenant-Colonel Sir John Johnson led a group of United Empire Loyalists to the British army depot on the height of land on the north bank of the St. Lawrence River, near the present-day site of the Cornwall Community Museum in Lamoureux Park. Within four months, the group numbered 215 men, 87 women and 214 children, for a total population of 516. At first the settlement as simply called “New Town”, and then was referred to as “New Johnstown”. Within a few years, the new town was increasingly referred to as Cornwall. Thirty years later, these same people – who wished to remain loyal to Britain and its institutions – had to defend themselves once more against American armed forces during the War of 1812. From June 18, 1812 to February 16, 1815, the United States was at War with Britain. Canada was the battleground. The War represents an extremely significant chapter in the history of Canada and of the United States during which the Americans came very close to annexing Upper Canada (Ontario) and all territory west of it. In 1812, Great Britain had been locked into a long war with France. The British Royal Navy enforced a blockade of Europe to prevent supplies from reaching their enemy. British-born sailors manning ships from neutral nations, even those carrying American citizenship papers, were pressed into the service with the Royal Navy. To the new republic of the United States, these actions on the high seas and the seizure of American citizens violated American sovereignty. In response the United States declared War on Great Britain on June 18, 1812. The primary American war objective was the conquest of British North America, primarily Upper Canada (Ontario) and Lower Canada (Quebec). Cornwall was one of the largest settlements in Upper Canada at the time that war was declared. It would emerge as an important garrison town, communications and supply post during the War of 1812. The population of Cornwall was several hundred at the time. The St. Lawrence River was the “life-line” for the movement of goods and supplies between Montreal and Kingston, and as such it was crucial that it be protected. Every soldier, sailor and weapon needed to fight the war in Upper Canada passed through Cornwall. Deemed by the military to be nearly indefensible, nonetheless its strategic location at the head of the St. Lawrence Rapids made its defense crucial. Throughout the war, a number of skirmishes took place as American forces tried to disrupt this supply route. It is estimated that 4,000 voyageurs and 800 batteaux worked along the shores of the St. Lawrence River carrying vital war supplies to the Upper Province. Local men were recruited to protect their homes from the invaders and were organized into four sedentary militia regiments: 1st Glengarry, 1st Stormont and the 1st and 2nd Dundas Regiments. They wore regular clothing and used American Revolutionary vintage weapons and served without uniforms in supply and scouting functions. The Glengarry Light Infantry was mobilized in 1812 as a regular British army battalion. Detachments of Glengarry Fencibles fought across Upper Canada. The Fencible’s original parade ground was at St. Raphael’s, northeast of Cornwall. The unit was distinguished from regular British troops by their green tunics as opposed to the red British uniforms. Common family names that served in local militia can still found here today and include Anderson, Burton, Eamer, Empey, Cameron, Campbell, Fraser, French, McDonell, McIntosh, Robertson, and Scott. In November 1812, about 150 men attacked and overwhelmed a smaller American force at French Mills (Fort Covington) in retaliation for previous raids on the First Nations community of St. Regis. The Canadians captured 4 river boats (bateaux), 57 muskets, 47 soldiers and 3 officers. The prisoners were sent to Cornwall for eventual transfer to Montreal and later parole. The Battle of Crysler’s Farm played a pivotal role in the successful defense of Montreal and British North America. In early November 1813, an American army of nearly 8,000 troops, commanded by Major-General Wilkinson, left Sackets Harbour and slipped down the St. Lawrence as part of a two pronged attack on Montreal to cut Upper Canada off from Quebec and the rest of British North America. Wilkinson’s movements were followed and harassed by some 800 British Regulars, militia and Mohawk warriors, under the command of Lieutenant-Colonel Joseph Morrison. Morrison subsequently established a defensive position at John Crysler’s Farm near Morrisburg. On November 10th, a small skirmish took place at Hoople’s Creek, just east of Crysler’s Farm. 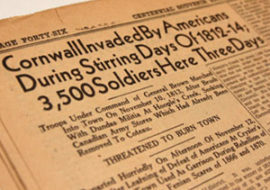 The next day, Morrison’s small army was attacked by 4,000 American troops. Morrison’s force rebuffed the Americans after a hard fought engagement. This defeat led to Wilkinson’s retreat and the end of the invasion of Upper Canada. The approximately 200 men from 1st Stormont Militia Regiment were charged with escorting military stores from Montreal. Cornwall’s main supply depot was located between the present day location of the Clock Tower and Cornwall Community Museum in Lamoureux Park. The militia also built a defensive blockhouse west of Cornwall. With notice of the invading American force, a decision was made to safeguard the military supplies stored in Cornwall. Militia loaded the military supplies and other government stores onto 150 wagons and departed Cornwall. This wagon train travelled by way of St. Andrews and Martintown to the defensive post at Coteau du Lac, east of Cornwall. On the morning of November 11th, 1813, American cavalry occupied Barnhart’s Island (just west of the RH Saunders Generating Station), and the western end of Cornwall. The village was undefended, except for a small scouting party of Stormont Militia and St. Regis Warriors. In Cornwall, American officers occupied farm houses while the men bivouacked in the field. Facing only women and children, the invaders were “civil and quiet” however they didn’t hide their desire to lay waste to the town and countryside before proceeding to Montreal. On November 12th, after learning of the defeat of the American forces at Crysler’s Farm, the occupying forces retreated across the river to winter quarters under the watchful eyes of the local militia. Within a week, Cornwall was reinforced with more men to protect river transport. By early 1814, there were over 800 troops stationed in Cornwall, a number that swelled to over 4,000 British regulars by September. Mary “Granny” Hoople was the first “doctor” in what is now Stormont County. She learned traditional native healing practices when taken prisoner by the Delaware Indians as a child. Granny Hoople tried unsuccessfully to save the life of an invading American rifleman wounded at Hoople’s Creek on November 10, 1813. After the War, the U.S. government compensated her for compassion. Bishop Alexander Macdonell, known as the “Big Bishop,” was the first Roman Catholic prelate of Upper Canada. Also known as the “Warrior,” he helped raise the Glengarry Light Fencibles, the predecessors of the SD & G Highlanders, and according to tradition, he urged on Canadian forces in the attack on Ogdensburg in 1813 and threatened immediate excommunication for those who did not move towards the enemy. Colonel Neil McLean, formerly of the Loyalist 84th Royal Highland Regiment commanded the 1st Stormont Militia during the War of 1812. Colonel McLean and his regiment saw action at the Battles of Ogdensburg (1813), Hoople’s Creek (1813), Crysler’s Farm (1813) and Salmon River (1814). Lieutenant Duncan Clark of the Dundas Militia can claim to be Canada’s Paul Revere. He was posted near Brockville to report on American troop movements down the St. Lawrence. On November 5th, 1813, he saw Major-General Wilkinson’s army set sail towards Cornwall. In response, he commandeered a plough horse, which he rode furiously along the Canadian side of the river warning of the impending invasion. John Strachan was an influential clergyman and educator and the founder of the Cornwall Grammar school. After teaching for 9 years in Cornwall, he moved to York (Toronto) in early 1812. Following the American invasion and occupation of York in 1812, none of the town’s civilian leaders seemed ready and able to negotiate with General Dearborn to stop the looting and burning. Strachan was untried, a new arrival from the town of Cornwall, but as rector of the church he stepped into the breach, going out to the American warship to represent the citizens of York. Strachan’s will power and personal presence was so strong that it was later said that it was difficult to tell from the interview which of the two men was the conquered and which the conqueror. Hinting at the possibility of a terrible retaliation by the British Navy, Strachan went a long way toward saving York from destruction. Lieutenant James Pringle of the 81st Regiment arrived in Cornwall in 1814. He was invited by Captain Joseph Anderson to breakfast and a fishing trip. On meeting the Captain’s daughter Anne, he was beguiled at once when the young lady “kindly asked me to take an apple.” Within a month, the couple were married. A son, Jacob Farrand Pringle became a local judge and wrote the first history of the United Counties. Several days later, the Americans withdrew to their winter quarters in French Mills (Fort Covington), New York. Due to its Loyalist beginnings, Cornwall could not at first boast of a substantial francophone community. The first official record of a francophone population dates to 1829, showing that 74 out of 812 Cornwallites were of French origin. Twenty years later, the census recorded that the number had jumped to 967. The first important influx of francophones into Cornwall and the surrounding area took place between 1870 and 1890, due to the opening of textile and paper mills, and the overall industrialization of the City, with the subsequent availability of employment opportunities. Since then, the francophone community has contributed towards giving the City of Cornwall its unique bilingual character. The early nucleus of the francophone community was Nativity Roman Catholic Church, which was built during 1887-92 from plans drawn by parish priest, Father P. DeSaunhac. Cornwall elected its first francophone mayor, Angus Lalonde, in 1904. The above has been prepared from a variety of sources with the kind and knowledgeable assistance of Ian Bowering, curator of the Cornwall Community Museum, which is operated by the SD&G Historical Society.